Start near Akmens Bridge and the Grēcinieku iela train station, heading north into the plaza of the House of the Blackheads and St. Peters Church. Crossing into the canal parks, pass the Latvian Museum of Natural History and into the Vērmane Garden, then Esplanade Park. On the northwest end of Esplanade, continue along Andreja Pumpura iela and Antonijas iela to Albert Street, famous for its Art Nouveau architecture. Crossing back through Kronvalda Park and along the canal. At the Freedom Monument, cross the bridge back into Old Town, then turn RIGHT onto Meistaru iela to see the Cat House, the Powder Tower, and the Latvian War Museum. 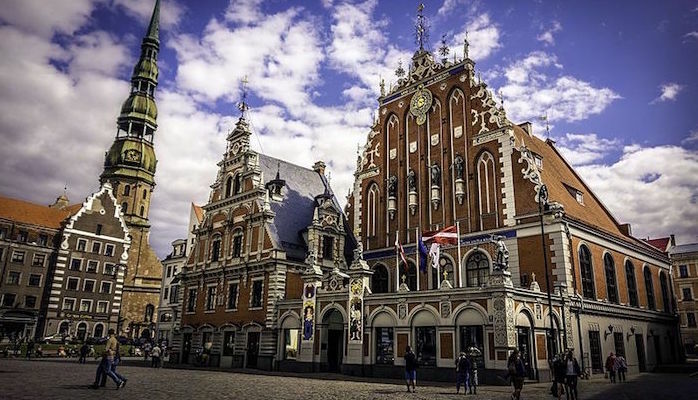 The route then dips down to the Three Brothers and Riga Castle before returning along the Daugava River.